10/10 Good examples of ketlebell routines! One of the best collections of hardstyle KB workouts I've found. While the number of actual programs are few, the many individual workouts are great and the authors offer recommendations for incorporating them into a complete program. The variety is great and the workouts can be easily modified for your goals. with the lower price of the ebook, it is a great value. Excellent book! A veritable collection of "evil" genius (in the nicest way) with the depth of knowledge and understanding to enhance the work of any serious trainer/ client. Inspiring gift that keeps on giving and as always with the R.K.C, there is something applicable for everyone. I have been recommending it to some clients and am looking forward to their feedback. I am studying the book and doing many suggested exercises and it's extremely powerful. It's a concentratiion of professional knowledge. Thank you ! 10/10 Great workouts and programs for all levels! This is really a great collection of programs and workouts from some of the best the RKC has to offer. For an instructor it gives great insight into what other RKC's are doing with their classes and clients. If you're not an instructor and just want to get in great shape, whatever your goal is, you can find a workout to achieve it here! Okay book. Not for beginners. Some programs/workouts are not clearly written and can be hard to understand. About the quality of the EFS eDownloads you get for free when you make a contribution to a charity they are supporting. Not worth the sale price and definitely not worth full price. Most all of the information is already floating out in cyber-space. Only benefit is having it in one download. Nothing from Pavel or Dan John. Over the past eight years I have been training very consistently with kettlebells and have purchased, studied, appreciated and implemented much of Pavel's writings. While most of Pavel's own writing is very focused and appropriately simple and direct, this collection is very uneven, random and while interesting for it's variety, contains very little that is applicable to my personal situation. I have enjoyed doing some of the routines but was generally disappointed in the usefulness of the content and feel that it was pretty much, a waste of my money. 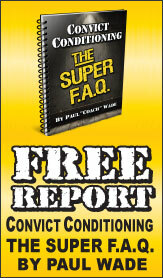 This book is a great set of workouts by many of the most respected experts in the field. However, it just contains lists of exercises, not descriptions of how to do the individual exercises themselves. So, it the terms "Two-handed Kettlebell Swing" or "Turkish Get-Up" are not a part of your exercise vocabulary, this is not the book for you. Try some of the videos by the authors of the various exercise routines first. I like seeing all the different workouts, some great ideas. The drawback for me is poor explanations of how to do many of the exercises. The reader is referred to other texts a lot of the time instead of having descriptions right there for convenience. Thumbs up for most of the work out ideas. Needed better descriptions of the exercises. I HAVE BEEN TRAINING WITH KETTLEBELLS FOR ABOUT ONE YEAR NOW, AND I AM NOT LOOKING BACK. I ALREADY HAVE A GOOD COLLECTION OF DRAGON DOOR DVDs ON KETTLEBELL TRAINING, AND THE ADDITION OF THIS BOOK IS JUST ANOTHER GREAT ADDITION TO MY ARSENAL OF RESOURCES. THE BOOK WILL PROVIDE YOU WITH A MYRIAD OF TRAINING IDEAS THAT YOU CAN ADD TO YOUR ALREADY EXISTING ROUTINES. 10/10 Something for Everyone, and Everyone you Train. If you have never swung a kettlebell before, this is not the book for you.. YET. This is not a how-to on the big 6 movements, a bodyweight movement how-to, or how to do thousands of swings, but that's ok, we've got those elsewhere! This is a FANTASTIC resource for those who have trained with an RKC trainer, and for RKC's of all levels everywhere. The list of contributors reads like a who's who of RKC awesomeness, and I'm proud to say I've met, and had the honor of training under several people on that list at my HKC and RKC. The programs in the first half provide a variety of as-is and framework for your own programming, or programming for client needs, while the latter half's single workouts are fantastic for when you want to get out of a rut. This is a book I am going to go back to time and time again for myself, and for my clients when I need some inspiration. For the trainer with a varied client base, or the experienced home kettlebell enthusiast who wants to spice things up a bit, I can't recommend this book enough. 10/10 The Book of RKC family! It's been a great insight to collect in one book training and programs produced by our teachers and colleagues. A unique opportunity to have on hand many interesting ideas to use for us and for our customers. Having the chance to see how work our colleagues is a great opportunity to improve and enhance their knowledge. It 's nice to see that in every part of the world from different countries speak the same language when it comes to training. This is the strength of RKC! I am disappointed in my purchase. My $40 could have been used far better elsewhere than on this incomplete advertisement for this compliation of magazine articles. The poor explanations and lack of appropriate illustrations make me a remorseful consumer. The book appears to be more of a sales tool for the contributors (?). Another must have from RKC, it is perfect for that day of kettlebell training that is not going so well. There are programs to fill in all the gaps. I use it as a reference and guide when my brain gets foggy but I still want to train with bells. Very practical. Good ideas to make your own training programme.